China is the world's third-largest country by area (after Russia and Canada) and the largest by population. Officially the People's Republic of China, it is bordered on the north by the Mongolian Republic and Russia; on the north-east by Russia and North Korea; on the east by the Yellow Sea and the East China Sea; on the south by the South China Sea, Vietnam, Laos, Myanmar (Burma), India, Bhutan, and Nepal; on the west by Pakistan, Afghanistan, and Tajikistan; and on the north-west by Kyrgyzstan and Kazakhstan. China includes more than 3,400 offshore islands, of which Hainan, in the South China Sea, is by far the largest. 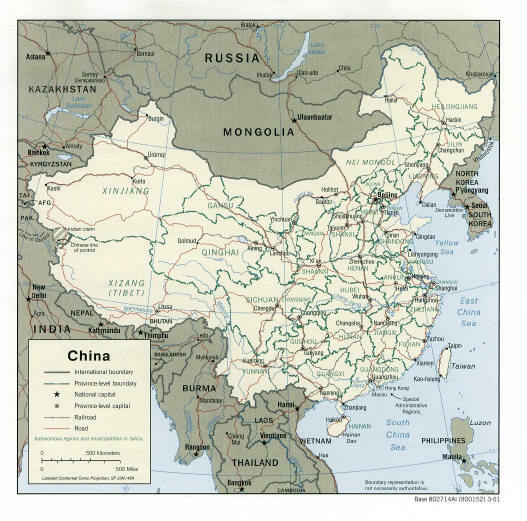 The total area of China is about 9,571,300 sq km (3,695,000 sq mi), not including Nationalist China or Taiwan. The capital of China is Beijing; the country's largest city is Shanghai. More than a fifth of the world's total population lives within China's borders. China gave birth to one of the world's earliest civilizations and has a recorded history that dates from some 3,500 years ago. Zhonghua, the Chinese name for the country, means "central land", a reference to the Chinese belief that their country was the geographical centre of the Earth and the only true civilization. Population 1,211,210,000 (1996 official estimate) Largest Metropolitan Areas Shanghai 14,150,000 Beijing 12,510,000 Tianjin 9,420,000 (1995 estimates) Ethnic Groups 93% Han (Chinese) 7% Other including Zhuang, Hui, Uygur, Yi, Miao, Manchu, Tibetan, Mongol, Tujia, Bouyei, Korean, Dong, Yao, Bai, Hani, Kazakh, Dai, and Li minorities Languages Official Language Mandarin Chinese (Putongua) Other Languages Six other major Chinese dialects Religions 69% Non-religious or atheist 20% Traditional Chinese beliefs mainly Confucianism and Daoism 9% Buddhism 2% Other including Islam and Christianity.